1 Preheat the oven to 180˚C, gas mark 4; lightly grease 2 deep 20cm cake tins and line the bases with baking parchment. 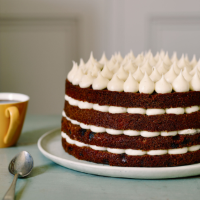 To make the cakes, put the grated carrot in a bowl with the sultanas; set aside. In a large bowl, mix together the flour, bicarbonate of soda, salt and spices. In another bowl, using a balloon whisk, whisk together the eggs, sugars and olive oil until evenly combined. Pour the egg mixture into the flour mixture and whisk together lightly until just combined. Add the carrot mixture and the orange zest, then stir gently to combine. Divide the batter evenly between the prepared tins and bake for 30-40 minutes, until a skewer inserted into the centres of the cakes comes out clean. Leave to cool in the tins for 10 minutes before inverting onto a wire rack to cool completely. and the frosting will be too loose). 3 To decorate, use a large serrated knife to slice each cake carefully through the middle into 2 (see tip on page 107). Scrape the buttercream into a piping bag fitted with a plain round piping tip, about 1cm wide. Put one of the bottom layers onto a flat plate or cake stand. Pipe peaks of the frosting around the edge of the cake, then repeat in the middle of the cake in concentric circles. Repeat with the remaining cake layers. This is best served on the day it is made.